Since the spring of 2007, when the first touch screen mobile phone became available on the world market, mobile phone developers have been very busy. More companies are now bringing out touch screen versions of their phones – but are they really as good as they seem to be? The main advantage of having a touch screen phone is cosmetic. It is a great accessory to have and to be seen using. Touch screen mobiles can be small and slim and there are no bumps and bits, its all very sleek and smooth. Another pro is that a bigger screen fits in well with the multi-media functions on the latest mobiles. Watching video clips, whole films or TV programmes and looking at photographs is much better on the larger screen that covers the full area of the mobile. No space has to be wasted for the keypad. For music, photographs and videos, you hardly need buttons and you only need camera buttons when you take a picture. It makes sense for these to appear on the screen, rather than to stick out all over the phone. For texting and emailing, the touch screen does have some disadvantages (see later) but one of the good things is their flexibility. If you are used to typing on a keyboard, you can set the touch screen 'keypad' to be in the traditional QWERTY format but, if like me, you prefer to have the letters in ABD order, you can. Its just a matter of setting up the preferences. Anything new takes a while to get used to but the touch screen is so completely different to a keypad that some people can't get on with it for text messaging. A screen cannot provide the same feedback for your finger as a button – the screen is flat and although some mobile companies are trying to building haptic feedback – technology to give you finger the impression of pressing a button – it is far from perfected. The touch screen also makes it impossible to text using touch alone. No-one should ever text while driving but there are other occasions when texting while not looking would be useful. In a dark cinema (with the phone on silent), when watching TV, when walking through a busy shopping centre. Some people find that a touch screen is also too sensitive at times. If you just hover a finger over one of the on-screen 'buttons' it can be enough to be detected as a choice. If you hover over delete when an important text or email has just come in, that can be really annoying. Mobile phone technology is developing all the time and the latest software on touch screen phones does allow you to play some games that incorporate motion sensor technology. By tilting, turning and jogging the phone, you can feel you are much more part of the game. This sort of application will expand very quickly now, with new games available in the next two years. We are also likely to see more mobile phone companies bringing out their own touch screen phones, with even better and more impressive features than are standard on the currently available ones. Competition for the touch screen market in mobiles is likely to carry on being very fierce, and that should also force prices down. 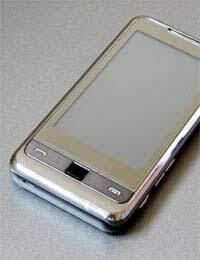 Recent news from the Mobile World Congress in February 2009 also unveils the worlds first touch screen mobile phone that is powered by solar cells. The front of the phone is an elegant touch screen, the back is a solar panel. It also has several other eco-friendly aspects, including being made from plastic recycled from unwanted water bottles.